Average mortgage rates today are nearly unchanged. Not unexpected after the midterm election, the conclusion of which did wonders for the stability of the US economy and interest rates. Today’s FOMC meeting conclusion is unlikely to move rates, lacking a press statement or speech following its conclusion. Other data are mixed, largely canceling each other out and resulting in the stalemate we see above. 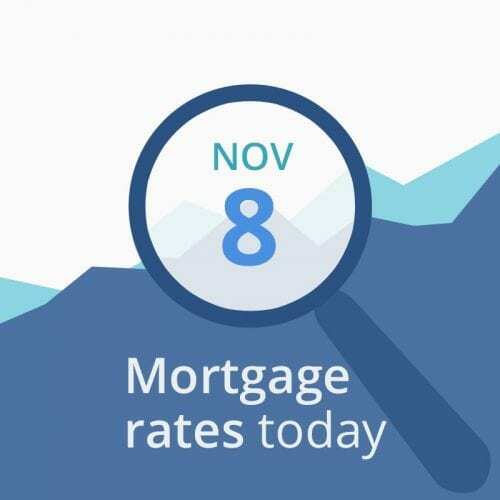 Mortgage rates dropped after the election yesterday, and have not increased despite some unfavorable economic data early this morning. I’d recommend locking if you’re closing soon. Mortgage rates are likely to increase in the months following the election. Statistics show that the economy and interest rates tend to heat up in the 12 months after an election no matter who wins. But rates were already on a tear leading up to this election, and putting the mid-term to bed allowed things to settle down in the immediate aftermath. This week brings few scheduled economic reports pertaining to mortgage rates. But we do have this small matter of a national election on Tuesday. Tuesday: US national mid-term election and a Treasury auction of 10-year Notes. Demand for these notes could affect mortgage rates; high demand would cause the prices of bonds and mortgage-backed securities to rise and yields (rates) to fall. The opposite is also true. Friday: Producer Price Index (PPI), which shows costs at the manufacturing level. Increases eventually find their way to the consumer level and eventually increase costs, which tends to push interest rates as well. Experts anticipate a .2 percent increase from September. More would be bad for rates, less would be good. In addition, the University of Michigan releases its preliminary Survey of Consumer Sentiment, which measures consumers’ likelihood of major purchases in the near future. High is bad for rates, low is good. Analysts project a decrease from 98.6 to 98. However, the election results could change this.